Ellen updates Jessie on the latest news. 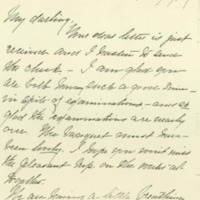 Your dear letter is just received and I hasten to send the check.—I am glad you are both having such a good time—in spite of examinations,—and so glad the examinations are nearly over. The banquet must have been lovely. I hope you won't miss the pleasant trip on the water altogether. We are having a little breathing space after the rush of last week, and very grateful it is. I can hardly keep awake, either night or day for the last forty-eight hours! We had a new minister yesterday and a very interesting one, Pres. Rush Reese of Rochester University. Judge Henderson and George also dined with us Syesterday. It has poured rain all yesterday and—today. I am so sorry that you too are having such rainy weather. So you are plotting to get Nellie there after all! Well, if she likes it I have no objection; I don't care so much for St. Mary's with Rose away. Perhaps you have already persuaded her. She has said once or twice lately that she did not see how she could go so far away again. Do you think she could get an interestingoneyear course at Balt.? The Freshman year here, you know, is a rather dull grind. That is my one doubt about changing now. The McElroys have sailed for 15 mos; and the Harpers and the Vreelands both go this week—the Harpers also for 15 mos. How we shall miss them!The stained-glass window is done & will go up before commencement. Mrs. Morgan says it is fine. The check is for $35.00, ten for Margarets allowance & travelling, and the rest for you; if you want more write for it, dear. Wilson, Ellen Axson, “Ellen Axson Wilson to Jessie Woodrow Wilson Sayre,” 1907 May 27, WWP17399, Jessie Wilson Sayre Correspondence, Woodrow Wilson Presidential Library & Museum, Staunton, Virginia.